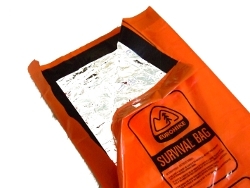 Traditional survival equipment to protect oneself, or a casualty, from the elements have been the orange plastic survival bag and the silver foil 'space blanket'. Both have their strengths and weakness but neither of them offer a real solution to a casualty who is cold and / or immobile. 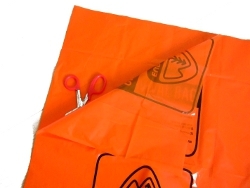 The orange survival bag is simply a large plastic bag. It is waterproof and relatively robust. By keeping the occupant protected from wind it reduces heat-loss by convection. It is easy enough to get into the bag if you are fully mobile but almost impossible to get a casualty into the bag who either can't move or you want to keep immobile. The silver space blanket is wrapped around the casualty to keep them warm - notice the phrasing: Keep them warm. Being reflective the blanket reflects heat lost by radiation. If the casualty is hypothermic - and therefore not radiating any heat - it will not keep the casualty warm. It can be difficult to completely wrap the casualty and fully remove windchill (heat-loss from convection) and being relatively thin, it is unlikely to prevent a hypothermic casualty getting even colder. Open up the survival bag and cut straight down the full length. There is no need to cut across the bottom, in fact it is more usable if the 'foot' is kept. Lay open the silver 'space blanket'. A large blanket can be folded in half - this will increase durability and add another layer of air to the sandwich you are going to make. 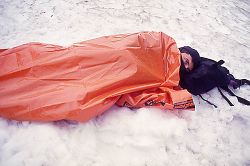 Lay the blanket on top of the now open survival bag. Position the blanket centrally and more towards the top of the bag: This is where you want the most protection, around the torso, not around the legs and feet. Tape the blanket in place. Create a nice wide boarder of tape to ensure the blanket is stuck down securely. Don't worry about getting all of the air out between the layers. Air space is an insulator. 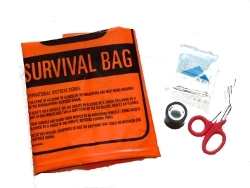 Fold up your new and improved survival bag carefully. It will be a little more bulky than before but will 'flatten down' after spending some time in the bottom of your rucksack. keep a warm casualty warm.